March 7, 2014 Nouakchott (AFP) – The Mauritanian government has ordered the closure of several Islamic charities for ‘overstepping their mandate’, a security official said on Friday, including an organisation with links to the Muslim Brotherhood. No official explanation has been given for the crackdown but ministers made the decision after holding a cabinet meeting on Thursday to discuss security issues and ‘the consequences of past excesses on the stability of the country’, the official told AFP. Authorities sealed off premises across the country belonging to the Association for the Future of Preaching, Culture and Education (AFPCE), a charity run by Mohamed El-Hacen Ould Dedaw, who is widely referred to as ‘the spiritual father of the Muslim Brotherhood in Mauritania’. Ould Dedaw was jailed under the regime of then president Maaouya Ould Taya after being arrested in the aftermath of a failed coup attempt in 2003 by the ‘Knights of Change’, a rebel movement formed by army officers accused of having ties with Islamists. The AFPCE released a statement denouncing its closure as ‘an action targeting a forum for preaching and culture that has taught generations about morals and the word of God’. 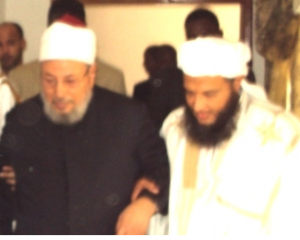 In May 2010, Mauritanian media carried an article discussing the visit of Youssef Qaradawi to the home of a local political figure and noting that Qaradawi was accompanied by Mohamed El-Hacen Ould Dedaw, identified above as the head of the banned charity. The GMBDW has also reported on Abdallah Bin Bayyah a well-known Global Muslim Brotherhood figure originally from Mauritania but last known to be living in Saudi Arabia. The GMBDW reported in September 2013 that Bin Bayyah had resigned from the International Union of Muslim Scholars (IUMS), headed by Qaradawi. In June 2013, Bin Bayyah visited the White House where he met with senior White House officials and representatives of other government agencies including an aide to President Obama and US OIC Envoy Rashad Hussain.